Yesterday I bought a a cute tea set. I am having fun playing with my set. Today we went to the local nature park. We ate our Wendy's meal then played at the play ground. After that we walked a little while on one of the nature trails. We saw some new flowers and a baby turtle. When we got home we had snowcones and watched Tom and Jerry. Then I read (and finished!) Prince Tom Champion Dog. It was a good book, much more interesting than a normal true story. Now I am watching Smallville. Recentley I have been making tons of little paper computers. They are very cute. I made up a computer compony called Rectronia that I "buy" my comperters from. I've been knitting a lot. 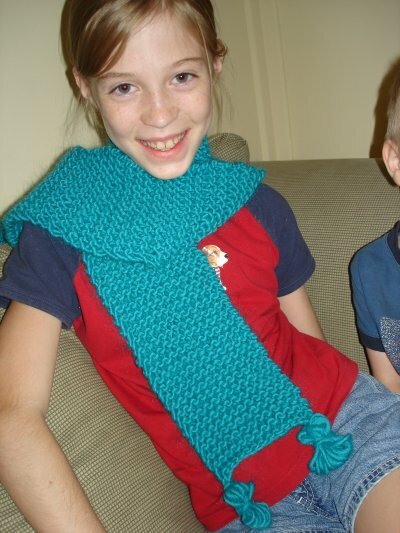 Here is me wearing my scarf I knitted. 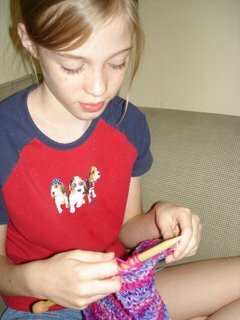 Here is a picture of me knitting. I've also got a knitting measurer. It's two peaces of green paper taped together. I put my knitting on it every ones and a while and mark down how long it is. I also measure it and white down what the date and time it is. I finished the blue scarf in one day! Today we went to a plant nursery. On the way home Allie asked where we were going. Poppy answered, "Home Sally, home." I said, "Her name is Allie, not Sally." Than Allie said, "Mr. W calls me Sally." And I told Poppy, "He calls me Buttercup." Allie interrupted, "No he doesn't, he calls you Banana Peels!!!" This was a really good book. It had 98 pages and I read it in around 3/4 of an hour! So far today I've been having a great time.